Architect Peter Pichler is the person behind the complete makeover of the Hotel Schgaguler in Kastelruth, South Tyrol. Architect Peter Pichler is the person behind the complete makeover of the Hotel Schgaguler in Kastelruth, South Tyrol. The 1986 architecture has been completely restyled with a project featuring a simple, sleek aesthetic to create a real sense of wellbeing. When you’re deciding where to go for a holiday, the appearance of the facility is definitely an important factor to consider. So the owners of the Hotel Schgaguler in the small mountain village of Kastelruth, near the Seiser Alm Dolomite plateau and Val Gardena decided to give their old 1980s hotel a complete makeover. The competition for the project was won in 2015 by the studio of the Italian award-winning architect Peter Pichler. The reconstruction itself took only five months, from March to July 2018. The Milan-based architect is originally from South Tyrol and won the award in the Bars & Restaurants category of the 2018 ArchMarathon Awards for his Interior Design of the Oberholz Mountain Hut, a mountain hut restaurant also in the Dolomites. 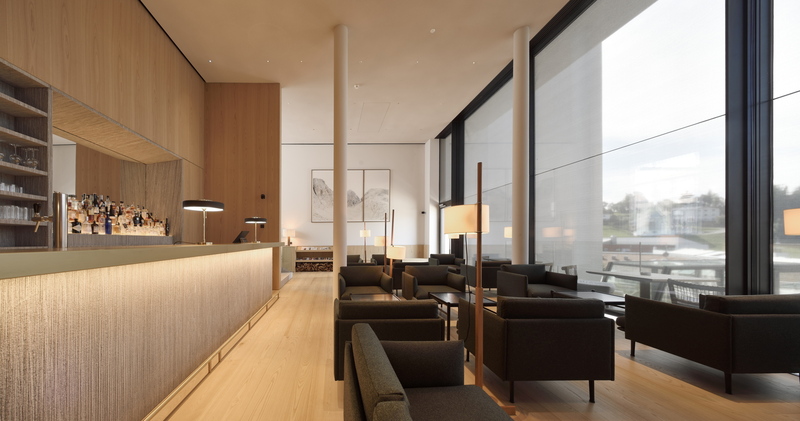 For the revamp of the Hotel Schgaguler, like for his award-winning architecture, Peter Pichler’s project focuses a great deal on the materials. Set in the backdrop of the picturesque village of Kastelruth, Pichler gives an Alpine style to the pared-back aesthetic, turning a typical, rather introspective South Tyrol hotel into an open, transparent drawcard for guests. Because inside too, precisely because of the transparency and openness, guests can feel the ties with the village and surrounding mountains. The new project for the Schgaguler is structured in three monolithic volumes, following the building’s original structure before the rebuild. With respect for the local context, the strong architectural identity of the hotel follows a contemporary reinterpretation of the vernacular style. Pichler frees the hotel from its weight and plays with typical elements such as the sloping roof. The facade changes according to the orientation and the plan. So, the almost sculptural north and east side, where the hallways and public spaces are located, is not particularly deep. Contrasting with this is the south-facing facade, where the geometry is punctuated by deeply inset patios with natural shading. The bright grey colour of the facade is reminiscent of the rocks of the surrounding mountains, underscoring the ties with the natural context. Pichler also focuses on local tradition and culture in the interiors. He uses these as key elements for the Hotel’s makeover, at the same time restyling them with a contemporary feel, together with the owner Martin Schgaguler. He uses traditional materials like chestnut wood, stone and local fabrics in the simple, functional open areas. The lobby, bar and restaurant are all located on the ground floor. The bar opens onto a large, sun-drenched terrace with impressive views of the Sciliar mountain. The basement level accommodates the spa, beauty and wellness facilities. The hotel rooms and suites on the upper floors are characterised by an elegant, timeless design and feature floor-to-ceiling windows leading onto the balcony. 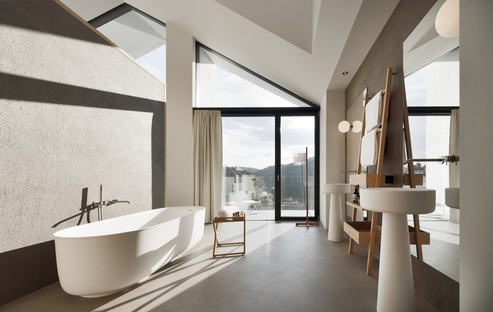 By adopting this design approach, Pichler gives the rooms added light as well as a spectacular visual connection with the village and with the Alpine landscape for a real feeling of wellbeing.